A nod to days of the silk cravat and film stars of yesteryear. 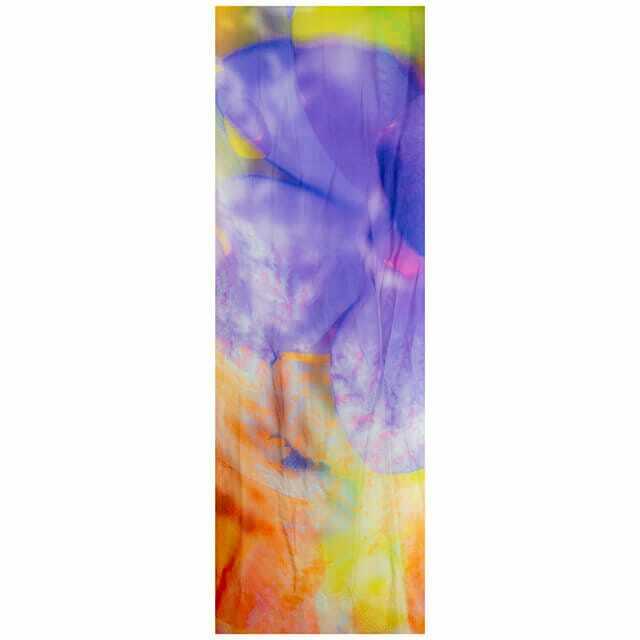 This silk scarf is characterised by the artistic application of cutting-edge professional digital photography equipment, combining this with hand-drawn digital vector artwork. This product beautifully showcases the vibrant digital print method produced in Worcestershire, England and is generously sized. Habotai silk fabric is beautiful to the touch. Recognising a link between nature and engineering, the resulting designs are expertly manipulated into a pattern and applied to fine silk. Inspired by nature and engineering design Oliver researched with photography in the local field of reclaimed land, a once industrial area of Stoke-on-Trent that is now a victim of disuse and neglect, gradually being reclaimed by nature. 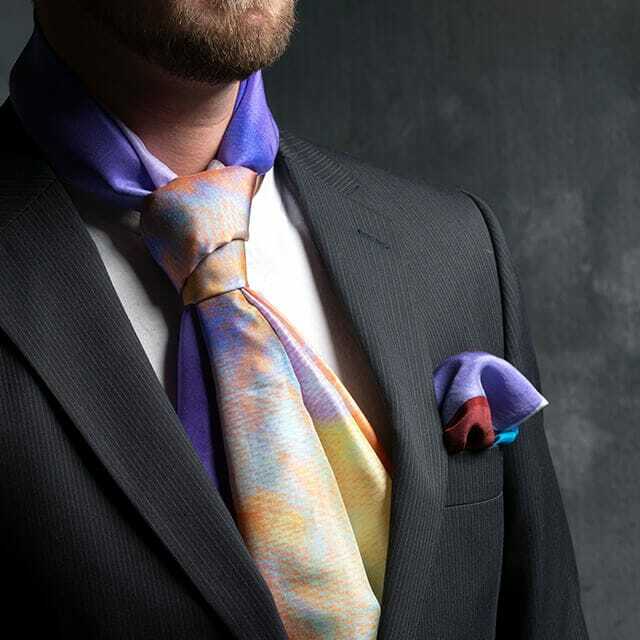 A new stance on formal wear highlighted with colourful silk scarves. A nod to days of the silk cravat and film stars of yesteryear. Masculine and romantic imagery portrays Olivers design style sublimely. Yes, we’re in love! 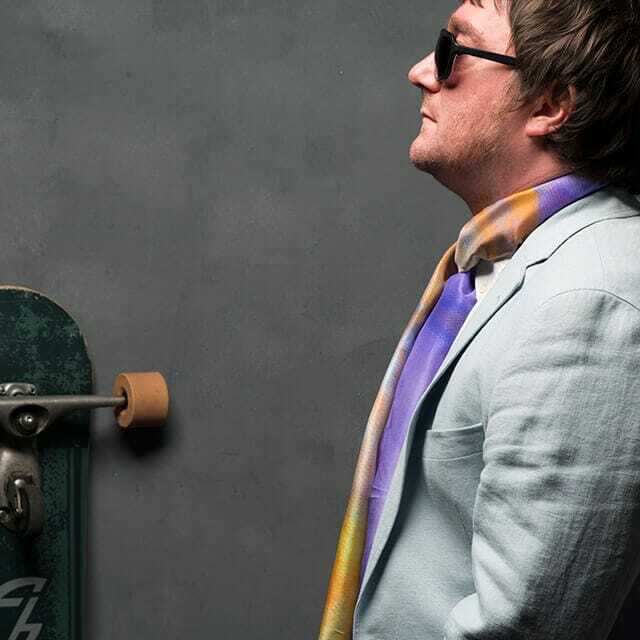 I have a collection of digitally and hand screen-printed silk, which is designed for scarves, pocket squares, or suit linings aimed at the male consumer. During my time at university I conducted indepth research into this niche area and found that the men's fashion market offered incredible prospects for innovation. The hand screen-prints, which are limited run become unique pieces as the process is done by hand. The material is printed in lengths of 200cm x104cm (approximately) while digital prints 190cm x 62cm depending on natural shrinkage during the process. My digitally printed silks are produced in an English factory where I can ensure quality and have a clear idea of the timing from placing an order to receiving the product. Using my individual design style and combining digital print with screen-printing which is an experimental process, I create unique, wearable pieces for the sartorial man. I currently do not know of any other scarf designers combining these methods. My larger vision for the business it's to engage men with fashion, textiles, colour and craft. From my research and experience, textile design in schools was often seen as a subject for girls. I know now that this is far from the truth and would like to address this bias in the social arena. I have been keen to develop skills in photography and use this as a primary research method, getting out into the field and following where my intrigue leads me, for my most recent work I have looked inside car and train engines, in live train yards and disintegrating local coal mines. With the camera I focused into smaller and smaller worlds,even getting into microscopy in the science labs as I examined mosses and ferns, plants that are literally clinging to rocks and reclaiming discarded machinery, thriving in the corners of coal carriages.